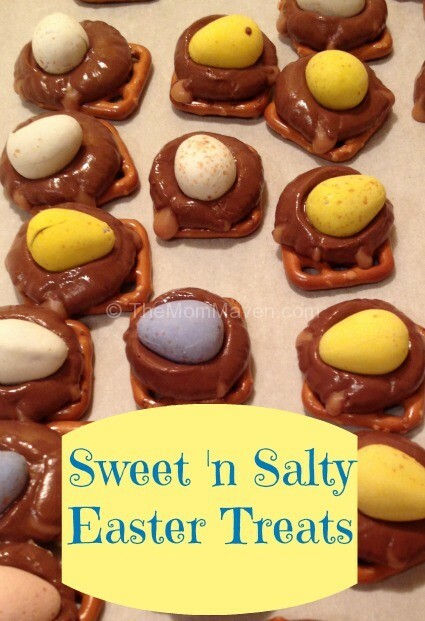 The other day when I posted my Easter Crafts with HERSHEY’S Chocolates I told you I was adding a bonus recipe post too…here it is! We were blessed with so much candy I needed to find another way to share it with you. 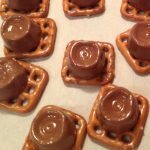 At Christmas time I had seen a bunch of recipes using pretzels and ROLO Candies that I knew I needed to add my own spin to it because as you know I am really into caramel and pretzel right now. 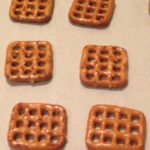 This recipe uses the square pretzels which Aaron my techie calls “8-bit Pretzels”. One of the churches we have been visiting was having a spring picnic last weekend so I agreed to bring a sweet treat and a side dish, this is the sweet treat I brought and it was a winner. I loved watching people pop one in their mouth and seconds later hearing oos, ahs and mmms! 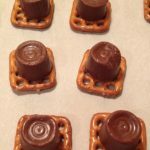 Unwrap the ROLO Candies and place one on each pretzel. Bake for 3-5 minutes. (You want ROLO Candy to soften but not melt so watch carefully). Remove from the oven and gently press a Cadbury Mini Egg into the ROLO Candy. It doesn’t get any easier than that! 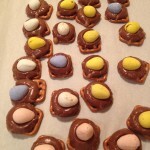 If you would like to find more HERSHEY’S recipes and crafts visit Celebrate With Hersheys.com. Make sure you enter to win your own HERSHEY’S Candies prize pack by entering my giveaway. Disclosure: I received product from Hershey’s and a stipend from Global Influence for this post. All opinions are 100% mine. Yum! These look delicious. I love how easy they are to make too. Yummy and easy to make, indeed this is a winning combinatio. These look wonderful! I love a creative sweet treat like this. And, bonus. It’s easy to make. I love the combination of salt and chocolate. These sure look easy to do! These look amazing and so easy to make!! I love chocolate and pretzel when they are combined! Boy, if this isn’t heaven on earth, I don’t know what is… I could sit down and never stop eating these! As soon as my daughter is done with her cheer tryouts at the end of the month, I’m going to make these. Like me, she needs to stay in shape and she wouldn’t be able to eat just one, lol! Nancy Lustri recently posted..St. Patty’s Day In Style! Those look easy AND delicious! That’s the perfect combination in my mind! What cute little nests! I love the combination of sweet and salty together, so this is a wonderful treat for me. I wonder how many dozens I would eat. We do something similar during Christmas and it’s always a hit. I didn’t think of doing it for Easter. Love it! Sweet and salty is my weakness! Then you go throwing caramel in there? I can NOT resist! These little treats are my absolute FAVORITE!! I’ve never tried them with the eggs, so I’ll do that this year!